Domenico Quaranta (1978, Brescia, Italy, http://domenicoquaranta.com) is an art critic and curator. He is a regular contributor to Flash Art and Artpulse. He is the editor (with M. Bittanti) of the book GameScenes: Art in the Age of Videogames (2006) and the author of Media, New Media, Postmedia (2010) and In Your Computer (2011). He has curated various exhibitions, including Holy Fire: Art of the Digital Age (Bruxelles 2008, with Y. Bernard), Playlist (Gijon 2009 and Bruxelles 2010) and Collect the WWWorld (Brescia 2011 and Basel 2012). He is a co-founder of the Link Center for the Arts of the Information Age (http://www.linkartcenter.eu/). 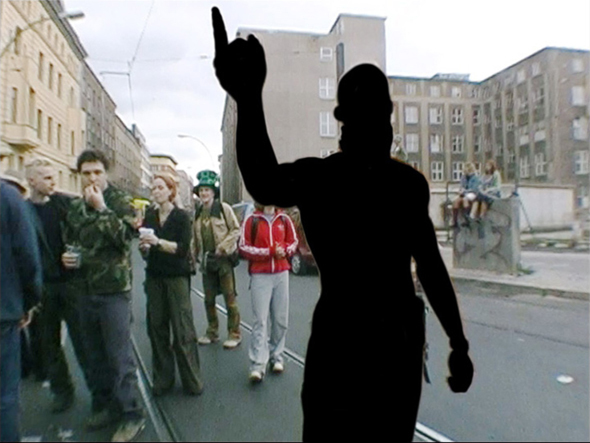 Matthias Fritsch is an independent artist from Berlin, most well known for his work Kneecam No 1—the live video that brought Technoviking to the internet. Over a decade after he uploaded the clip that went viral, Fritsch now is enduring a long legal battle with Technoviking himself, who sued for the reproduction, proliferation, and unwarranted use of his likeness. In response to the process, Fritsch is making The Story of Technoviking, a crowd-funded documentary that aims to shed light on the legal issues surrounding viral images. Below, Fritsch talks about what it’s like do battle in court with a viking, the ownership of images in the internet age, and hopes for his current project. DQ: Matthias, I'm of course curious about the video that originated it all. What was, for you, Kneecam No 1 (2000) before it became an internet meme? Why did you upload it to YouTube? Were you expecting such a viral reaction? What did you think when it happened? The "portal" designed by Antenna Design to show net based art in the exhibition "Art Entertainment Network", Walker Art Center, Minneapolis, 2000. Courtesy Walker Art Center, Minneapolis. In the late nineties and during the first decade of this century the term “new media art” became the established label for that broad range of artistic practices that includes works that are created, or in some way deal with, new media technologies. Providing a more detailed definition here would inevitably mean addressing topics beyond the scope of this paper, that I discussed extensively in my book Media, New Media, Postmedia (Quaranta 2010). By way of introduction to the issues discussed in this paper, we can summarize the main argument put forward in the book: that this label, and the practices it applies to, developed mostly in an enclosed social context, sometimes called the “new media art niche”, but that would be better described as an art world in its own right, with its own institutions, professionals, discussion platforms, audience, and economic model, and its own idea of what art is and should be; and that only in recent years has the practice managed to break out of this world, and get presented on the wider platform of contemporary art. It was at this point in time, and mainly thanks to curators who were actively involved in the presentation of new media art in the contemporary art arena, that the debate about “curating new media (art)” took shape. This debate was triggered by the pioneering work of curators – from Steve Dietz to Jon Ippolito, Benjamin Weil and Christiane Paul – who at the turn of the millennium curated seminal new media art exhibitions for contemporary art museums; and it was – and still is –nurtured by CRUMB - “Curatorial Resource for Upstart Media Bliss” - a platform and mailing list founded by Beryl Graham and Sarah Cook in 2000 within the School of Arts, Design, Media and Culture at the University of Sunderland, UK. As early as 2001, CRUMB organized the first ever meeting of new media curators in the UK as part of BALTIC's pre-opening program – a seminar on Curating New Media held in May 2001. • HOW. You can apply by sending to the email address info@linkartcenter.eu a short concept / description of your book proposal, together with a short bio and a sample of what you want to do. Language of the application: English. • WHEN. The deadline for the submission is December 31, 2015. After the deadline, the jury (Domenico Quaranta / Link Art Center; Fabio Paris / Link Art Center; Gabrielle Jenks / AND; Ruth McCollough / AND) will meet and select the proposal that will be commissioned in 2016. The winner will be announced end of January 2016. The project will be released in two steps (online project + publication) before August 2016. Adam Rothstein, Astronaut Luggage, Link Editions 2015. Paperback, English, 128 pp., black & white, ISBN 9781326081423. Link Editions is proud to present Astronaut Luggage, a book of speculative fiction by American artist and writer Adam Rothstein. The book is now available in our “Clouds” series as a print on demand paperback, a free download pdf and an e-book. Adam Rothstein (www.poszu.com) is an insurgent archivist and artist. He writes about politics, media, art, and technology wherever he can get a signal. He is most interested in the canons of history and prediction, the so-called “Future-Weird”, the unstable ramifications of today’s cultural technology, and the materials and ideas out of which we build things. This book is made in the framework of Masters & Servers, a joint project by Aksioma (SI), Drugo more (HR), Abandon Normal Devices (UK), Link Art Center (IT) and d-i-n-a / The Influencers (ES) that was recently awarded with a Creative Europe 2014 – 2020 grant. For 24 months from now, Masters & Servers will explore networked culture in the post-digital age. The Link Art Center is proud to announce 6PM Your Local Time Europe, a huge distributed art event that on the evening of July 22, 2015 will involve museums, institutions, galleries and artists from all over Europe, coordinated by the Link Art Center from a temporary office installed in the fascinating location provided by the Castle of Brescia, Italy. 6PM YOUR LOCAL TIME (6PM YLT) is a networked, distributed, one night contemporary art event taking place simultaneously in different locations, coordinated from one central venue and documented online via a web application. After a beta test successfully organized in the United Kingdom in October 2014, the format will show its full potential on July 22, when 200+ participants from 4 different time zones will open their exhibit at the same time, documenting them in real time on the web platform 6pmyourlocaltime.com, the event’s primary venue. Curated by Fabio Paris, the event will be orchestrated by a team of collaborators from a temporary office installed in the fascinating location provided by the Castle of Brescia, where the flow of images and videos from all over Europe will be displayed in front of the audience of the MusicalZOO Festival, the local partner of the event. Along the upcoming months, the Link Art Center will work on sending out invitations and on finalizing the list of participants. The staff will be available to evaluate proposals from institutions, galleries and artists interested in the event, and to reply questions and requests unanswered by the information already available on the website 6pmyourlocaltime.com. The event 6PM Your Local Time Europe is done in collaboration with Gummy Industries and the festival MusicalZOO, and with the support of Comune di Brescia, Fondazione Brescia Musei and Università Cattolica del Sacro Cuore, Brescia. 6PM YOUR LOCAL TIME (6PM YLT) is a networked, distributed, one night contemporary art event, which takes place simultaneously in different locations, coordinated from one central venue, and documented online via a web application. Furtherfield is hosting the first UK event, chosen for its history of critical engagement with networked culture. Including a few, selected participants, the event will work as a beta test for the web platform and for the organizing body that will launch, on July 22, a massive 6PM YOUR LOCAL TIME event, distributed all over Europe. At 5.30 pm, Domenico Quaranta and Fabio Paris from Link Art Center will talk through their ambitions and inspiration for the project. For the duration of the event, participating venues and their audiences across the UK will be testing the platform by sharing documentation images and videos of their events under the same hashtag, #6pmuk. The audience at Furtherfield will be able to enjoy the live feed from all the locations involved, and to discuss the project with us. Artists, technologists, network thinkers and makers are invited to join us to learn more about the conceptual framework for 6PM YLT and talk through how it can evolve, in anticipation of its European launch in July. Food and drinks will be available! 6PM YLT is a format conceived by the Link Art Center and developed in collaboration with Abandon Normal Devices (AND) and Gummy Industries. 6 PM YOUR LOCAL TIME (6PM YLT) is a networked, distributed, one night contemporary art event taking place simultaneously in different locations, coordinated from one central venue and documented online via a web application. The locations (institutions, non-profit spaces, commercial galleries, artist’s studios) will address their local audience and, through the dedicated web platform, a global audience. While visiting your local 6PM YLT event(s) will allow you to experience a single portion first hand, the only way to get the whole picture will be to access its online documentation: all exhibits will be documented and shared in real time by organizers and audience on the dedicated web platform, thanks to a web application aggregating content from different social platforms. The lead partner will coordinate the event from one central venue, and will put on display the event itself, screening the live feed from all the locations involved, and eventually making additional documentation available in different ways, ie. arranging video conferences with specific venues, or printing out images in real time and displaying them as a wall installation. After the launch event, 6PM YLT will become an open format available for anyone to utilise. The lead partners will maintain the platform and support the coordination of events all around the world. Today, art is mostly experienced through its documentation. Even if globalization made it easier and cheaper to organize exhibitions, ship artworks, invite artists and move audiences to any part of the world, the excess of cultural activity all around the world makes it impossible to be everywhere at the same time. Bits are still faster and cheaper than atoms, and we can enjoy them more comfortably on different devices. The border between first hand and second hand experience, reality and media documentation becomes increasingly blurred, with a profound impact on the way art is produced and documented. Almost every art-addict is now using social networks like Instagram, Twitter and Facebook to take photographs during art exhibitions and to share them with their contacts. The pictures already have some meta-data that we could use to trace them and to collect them: #hashtags, captions, geographical data, publishing date. By suggesting the use of a given #hashtag to all the organizers and audience participants, we can collect and show all this documentation on a dedicated web platform. Our software will automatically collect all the pictures and tweets produced about the 6PM YLT event, and will show them in a single gallery. Furtherfield was founded by artists Ruth Catlow and Marc Garrett in 1997 and is been sustained by the work of its community; specialist and amateur artists, activists, thinkers, and technologists, who, together cultivate open, critical contexts for making and thinking. Furtherfield is now a dynamic, creative and social nerve centre where upwards of 26,000 contributors worldwide have built a visionary culture around co-creation – swapping and sharing code, music, images, video and ideas. More info: www.furtherfield.org. 6PM YOUR LOCAL TIME is realized in the framework of Masters & Servers, a joint project by Aksioma (SI), Drugo more (HR), Abandon Normal Devices (UK), Link Art Center (IT) and d-i-n-a / The Influencers (ES) that was recently awarded with a Creative Europe 2014 – 2020 grant. For 24 months from now, Masters & Servers will explore networked culture in the post-digital age. Link Editions is proud to announce “Open”, a series of catalogues, essay collections and pamphlets co-published with partner institutions. The series makes available to art institutions that are interested in publishing but aren't able to find a sustainable production and distribution channel access to Link Editions' publishing expertise and distribution platform, allowing them to reach a wider audience at a viable price. Link Editions publishes all its books in print on demand, accessing all the channels of distribution made available from Lulu.com: the Lulu store <http://www.lulu.com/spotlight/linkeditions> as well as retail distribution on Amazon, Barnes and Nobles, Ingram and other stores. Furthermore, Link Editions makes all its books available for free download in .pdf format on Lulu, Issuu and on its own website <http://editions.linkartcenter.eu/>, and sells selected books in e-book format on various online platforms including Lulu, iBookstore Apple, Amazon, Nook and Kobo. “Open” already features a number of titles, including Best of Rhizome 2012 (co-published with Rhizome, New York), The F.A.T. Manual (co-published with MU, Eindhoven), Troika and the exhibition catalogue Eternal September. The Rise of Amateur Culture, both co-published with Aksioma, Ljubljana. Recent publications include Torque#1. Mind, Language and Technology, co-published with Torque Editions; U+29DC aka Documento Continuo, co-published with Viafarini DOCVA, Milan; and Cyposium – The Book, co-published with La Panacée, Montpellier. Torque#1. Mind, Language and Technology is the result of a wide range of cross-disciplinary conversations, taking place across symposia, online forums, live events and workshops, produced by the book’s editors: Nathan Jones and Sam Skinner. The book brings together a diverse collection of essays and artworks, many newly commissioned for the project, that reflect upon the plasticity of the brain, the adaptability of technology and the malleability of language, and their twisting together through past, present and future cultures. According to Professor Mike Stubbs, Artistic Director at FACT Liverpool: “Torque activities and this publication bravely push our boundaries of cognition and thinking, through striking essays, tricky concepts, and beautiful, arresting imagery.” Contributors include Lambros Malafouris, Emil Alzamora, Anna Munster, Benedict Drew, Esther Leslie, Cécile B Evans, Hannah Proctor, Nathan Jones, Stephen Fortune, Dennis Oppenheim, Lawrence Abu Hamdan, Holly Pester, Geoff Cox, Alex McLean, Kate Sicchio, Karl Heinz Jeron, Mez Breeze, Robert Sheppard, Chris Boyd, Imogen Stidworthy. The book will be presented at FACT Liverpool on the occasion of the opening of the Type Motion <http://www.fact.co.uk/projects/type-motion.aspx> exhibition on Thurdsay, November 13. U+29DC aka Documento Continuo by artist Enrico Boccioletti is an artist book and a research into that contemporary zeitgeist that has been labeled “post internet”. Originally conceived as a MA thesis, Documento Continuo is a textual and visual collage strongly relying on appropriation as the only possible way to draw your own path through the information overload. Written in Italian but mostly in “International Art English”, it focuses on issues like awareness, creolization, the crisis of the European Union, dematerialization and materiality, globalization, performance, identity, FOMO, and how to be an artist in the age of “always on”. The book will be presented at Viafarini DOCVA on Thurdsay, November 13, with a special event that will also include a live performance by the artist. Edited by Annie Abrahams and Helen Varley Jamieson, CyPosium - The Book presents a selection of artefacts from the CyPosium, a one-day online symposium organized in October 2012 for discussing the practice of cyberformance - live performance that uses internet technologies to connect remote participants. The 12-hour event featured 10 presentations and attracted an audience of over 100 from around the world who engaged in a lively, vibrant conversation. The book collects presentation texts, chat log excerpts, discussion transcripts, edited email conversations, creative chat excerpt essays and illustrations - along with invited articles that respond to the event. The contributors are Adriene Jenik, Alan Sondheim, Alberto Vazquez, Annie Abrahams, Auriea Harvey and Michaël Samyn, Cherry Truluck, Clara Gomes, Helen Varley Jamieson, James Cunningham, Joseph DeLappe, Liz Bryce, Maria Chatzichristodoulou, Maja Delak and Luka Prinčič, Miljana Perić, Rob Myers, Roger Mills, Ruth Catlow, Stephen A. Schrum and Suzon Fuks. Other books are on the way and will be available soon on all channels. If you are interested in the series or just want to know more, please drop us an email to info@linkartcenter.eu.